Mr Mohammed Hanif is a writer, journalist, playwright and reporter based in Karachi. He initially worked for Newsline and wrote for The Washington Post and India Today. He works as a special correspondent for BBC Urdu, London. He has to his credit many articles; novels; films and plays for radio, stage and screen, including a feature film The Long Night (2002), which is also Pakistan’s first digital feature film. He is also the writer of critically acclaimed radio play What Now, now that we are dead?, and a celebrated stage play, The Dictator’s Wife (2008). His first novel A Case of Exploding Mangoes (2008) has won him laurels, and it was long-listed for the 2008 Booker Prize, shortlisted for the 2008 Guardian First Book Award, and the 2009 Commonwealth Writers’ prize in the Best First Book Category. It won Shakti Bhatt first book award. 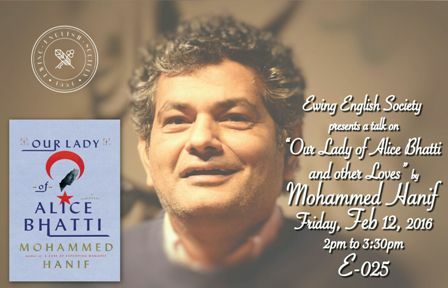 His outstanding second novel Our Lady of Alice Bhatti (2011) was shortlisted for the 2012 Welcome Trust Book Prize and for the 2013 DSC Prize for South Asian Literature. He is currently engaged in a collaborative work with composer Mohammed Fairouz on an opera titled Bhutto. Please join us on a talk by Mr. Mohammed Hanif on Alice Bhatti and other Loves on Friday 11 March 2016 from 02:00 pm to 03:30 pm in E-025.